External decoder : If you have any other external decoder and wish to use it, select it in the list. HamMultiPlayer will use it instead of mplayer decoding. AviSynth Source : This creates an AVS script to load current preview (may be slower). - AviSynth must be installed. - DirectShowSource may give good results. - No : Disables cropping. - Preview : displays a rectangle to preview cropping. - Yes : Enables cropping. - Width : Check this if you wish to crop horizontally. - Height : Check this if you wish to crop vertically. - Less & More : decrease or increase cropping using step defined. - Cropping Stepping : Defines how many pixels or lines are used for cropping (from 4 to 32). - Reset : Reset cropping to original preview coordinates. - Aspect : allows to crop image using aspect ratio presets -> 5/4, 4/3, 3/2, 16/9, 5/3, 21/9. - Detect : Auto detect cropping for current preview position. - Zoom : Zoom in picture using cropping (from 102 to 200%). - Zoom Cropping can be used to remove black borders or lines from sources. 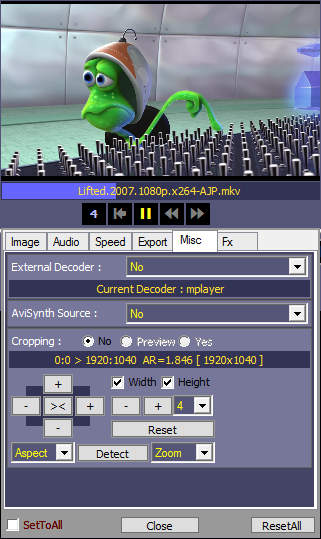 - Aspect Cropping can be used to change movie format without loosing visual aspect (16/6 -> 4/3, 21/9 -> 16/9, etc...). - You can for example watch previews in Mirror/Flip or Square mode. - Once started, use right mouse button to show/hide playing controls. Note : When using it, HamMultiPlayer will load current file to others preview to compose Fx display. When finished, previous files are reloaded. 3D Stereo display : Converts SBS (SideBySide) or OU (OverUnder) 3D Movies to Anaglyph (Red and blue) glasses. Note : Both 3D selectors have to be selected to work.